About "NIV Quickview of the Gospel of John"
This ebook is a tract for the 21st century. Because approximately 83% of human understanding occurs visually, the human brain needs both words and pictures for deeper understanding. Inside this ebook are infographics that present critical information about the Christian faith in an interesting, easy-to-understand way. The Gospel of John, the book of 1 John, and other study helps are included. 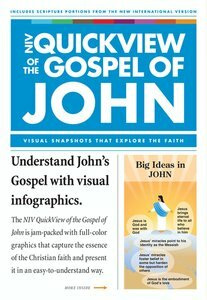 Using eye-catching infographics, the QuickView of the Gospel of John presents an overview of the Christian faith in an informative, understandable way. The full-color snapshots work together with the Bible text to help you develop a deeper understanding of the faith. The Gospel of John and the book of 1 John are included in this great evangelism resource, which is also packed full of helpful infographics. It's an engaging resource for when you want to introduce someone to the Christian faith, or when you want to make it easier for someone to understand the essentials of the Christian faith.